We’ve been working on more consistent branding (and a cleaner look to our branding) at our library for a while now. The process has been slow; we’re trying to make incremental changes when we can. When we learned that we were running out of library cards, we decided to seize the opportunity to redesign our library cards. We started talking about branding when we completed a website redesign in the spring of 2016. That project helped us settle on standard typefaces and colors. With those decisions made, we began rebranding our marketing collateral, starting with our print newsletter. We eliminated rogue typefaces, created a typographic hierarchy, and refined the color scheme to make our newsletters more modern and clean. 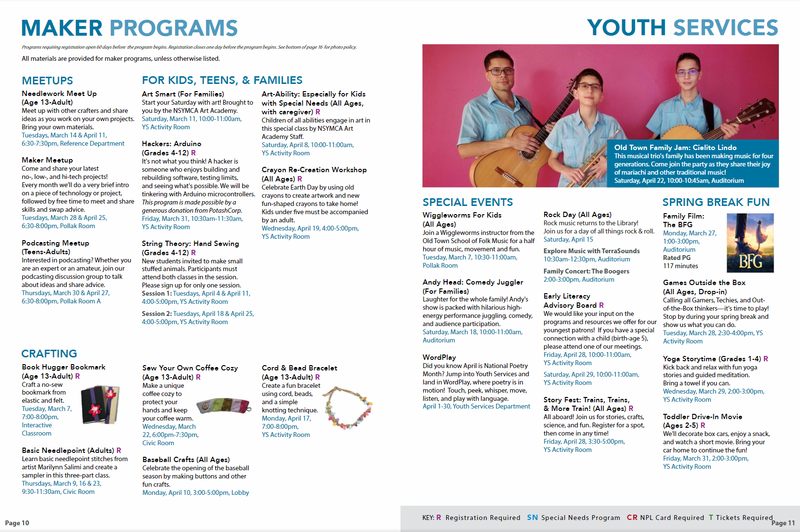 Sample pages from the redesigned newsletter demonstrates consistent use of fonts and colours, and a clean, bright design. In addition to being more consistent with typefaces and colors, we also wanted to introduce other elements that would connect patrons with our brand. We started using an abstract architectural motif of the building on the newsletter’s cover. We also introduced the tagline, “Where Community Happens,” that reflects the social and communal experience we strive to provide our patrons. 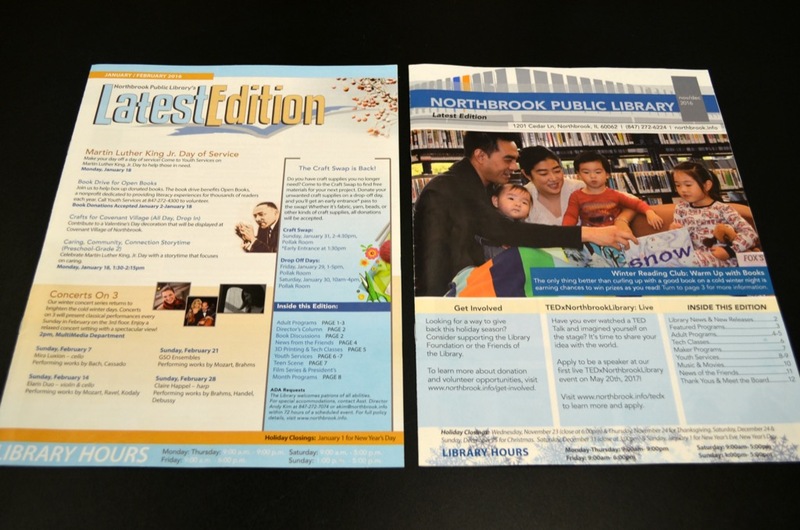 Northbrook Public Library’s newsletter, “Latest Edition” – the issue on the right features the updated branding. Note the architectural element at the top. 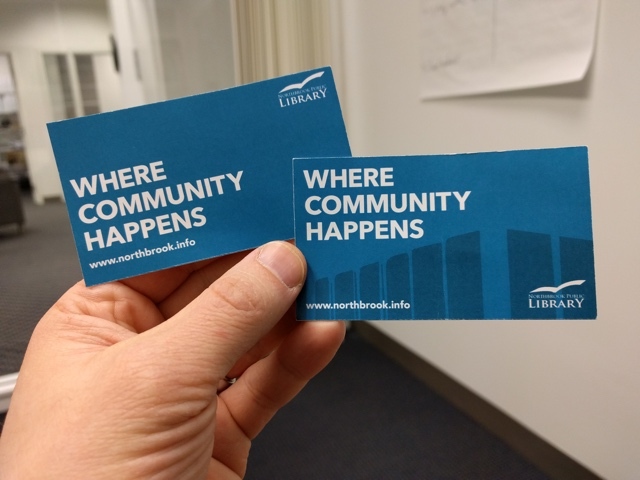 We kicked off our design process for the library card with a few distinct styles including a three-color illustration of the exterior of the library and a simpler version with our prominent brand color and white text. We tend to lean on images of the building in our marketing materials, so we didn’t go in that direction. The card with just color and white text might have been too minimal. 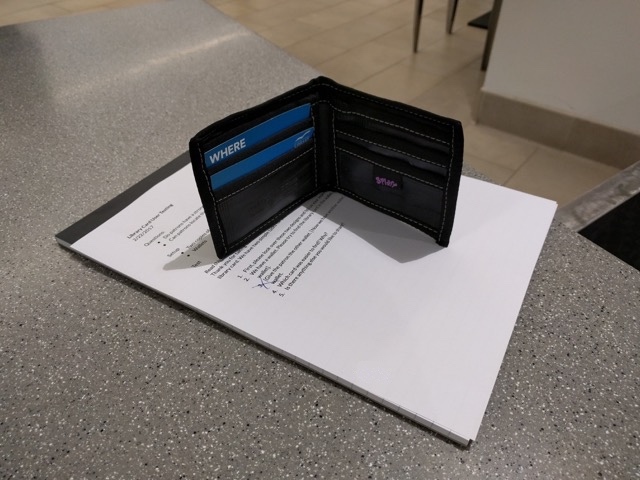 We looked at examples of credit cards and noticed how they fill the corners with design elements to make the card more identifiable in a wallet. We already had the tagline, website, and library logo in three corners. To tie these elements together, we decided to incorporate the building motif from our newsletter. Two “test” library cards, the left featuring a slightly more minimal design and a different arrangement of text, when compared to the right. 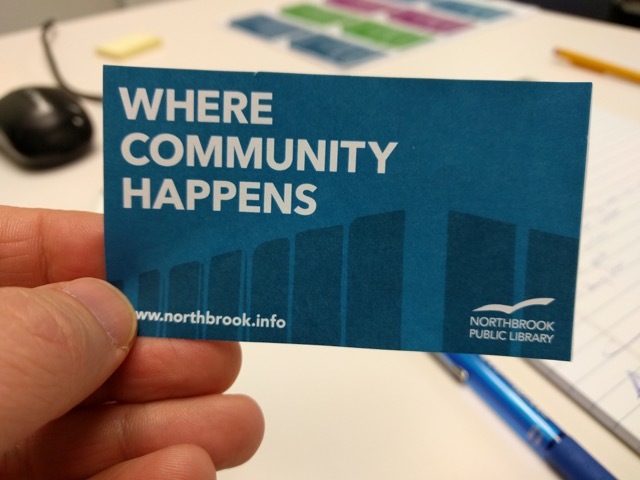 Will people identify this as a Northbrook Public Library card? Will they be able to find it in their wallet? 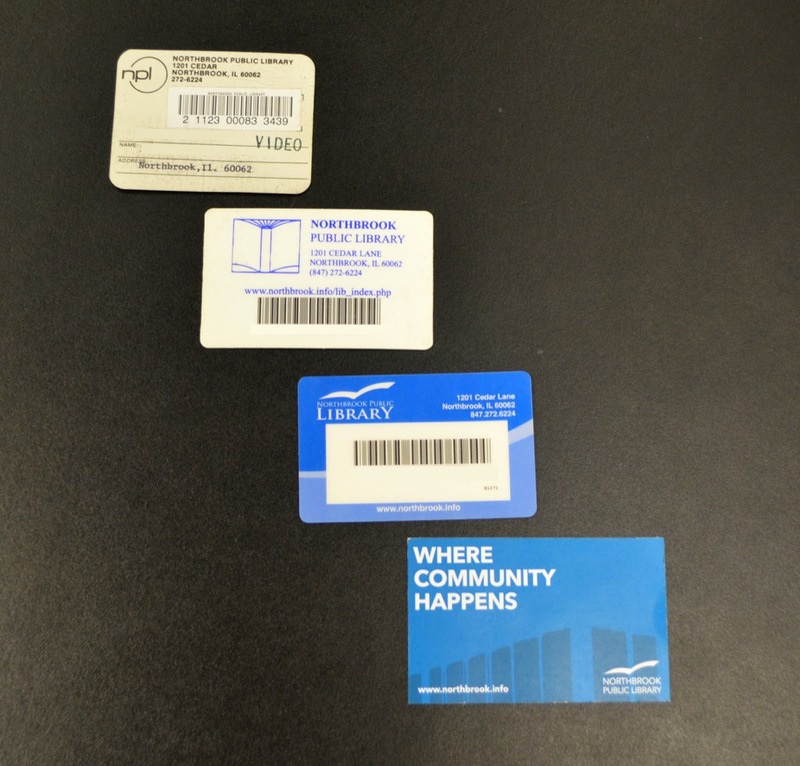 Our circulation manager pointed out that we have many versions of our library card in use now. What any given patron understands to be our library card would be hard to pin down. We also knew that people routinely handed over their insurance card instead of their library card at the circulation desk. We mulled these questions over in the group, but it was clear this was something that needed to be tested with patrons. Questions about behavior like this simply can’t be solved in a meeting room. We had to get out in the library and interact with real people. In this case, we designed the test to collect attitudinal and behavioral feedback. We presented two design options to the patrons and asked which one they preferred and why. Then we had wallets (a clutch style and a bi-fold style). We handed the wallet to the user and asked them which card was easier to find. Test library cards placed in a wallet for testing. Overwhelmingly, patrons preferred the architectural card design over the plain card design. Patrons thought the plain card was bland. One patron commented that the different shades of blue made the architectural card stand out more. A few patrons made the connection that the two-toned design on the architectural card was, in fact, architectural. One said it was unclear. The rest did not specify their feelings but still preferred it to the plain card. Patrons generally did not find either card design easier to find than the other; both options were acceptable. Most patrons cited the blue hue as their main tool in finding the card among other cards in their wallet. Some patrons cited a slight preference for the architectural card, since it had text in the upper left corner. From our user testing, we felt more confident about the architectural card design and we’re ready to order new cards!